Pregnancy is an exciting time as you prepare for your new baby. It is also a time of change in how your body looks and how you feel -- more tired, uncomfortable and even moody. Exercise may be the last thing on your mind, but it can actually give you more energy, relieve common pregnancy discomforts and improve your mood. 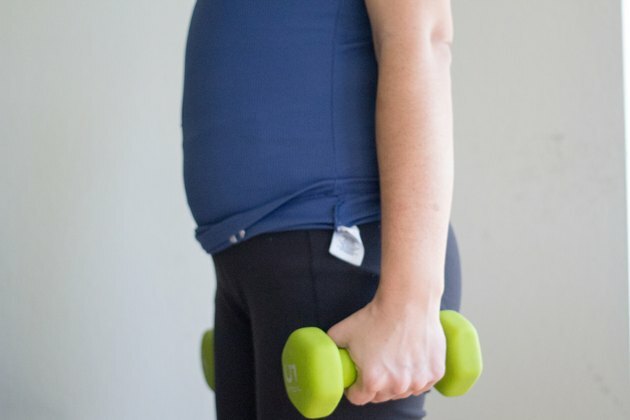 Most pregnancy exercises focus on toning the belly, back and legs, but it is important not to neglect your arms. 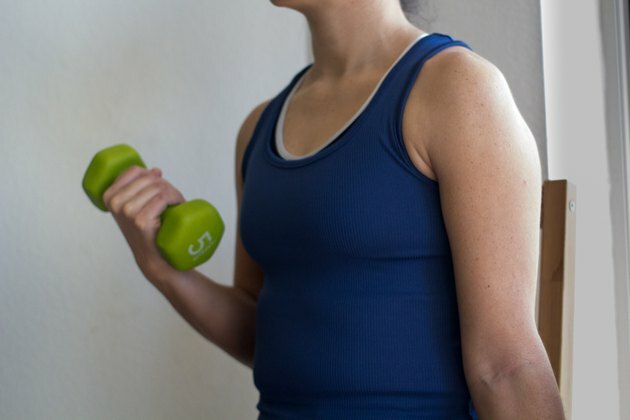 Keeping your arms slim and shapely can help you feel better about your changing body. Sit on a chair with feet flat on the floor and keep your back straight. Pull your navel in toward your spine to keep from arching, and pull your shoulder blades down and back. Hold a 5- to 10-pound weight in each hand. Keep arms close to your side with palms facing forward. You can use lighter weights if you have never lifted weights before. 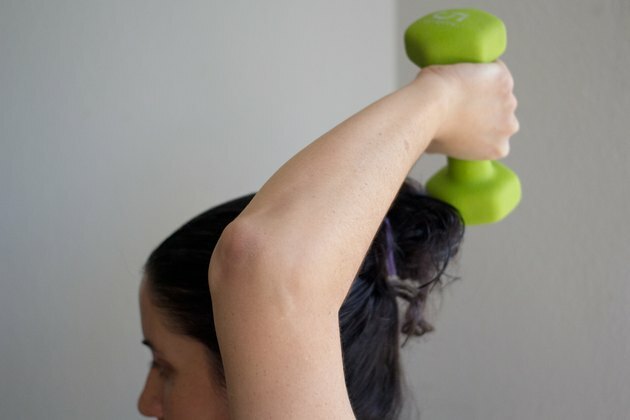 Keeping elbows stationary, bend your right arm, while curling the hand weight toward your shoulder. Lower back to start position and repeat with your left arm to complete one repetition -- one repetition equals one curl with each arm. Do two sets of 10 to 12 repetitions. Rest for one minute between sets. Sit on a chair with feet flat on the floor and back straight. Keep your navel pulled in toward your spine to prevent arching your back. 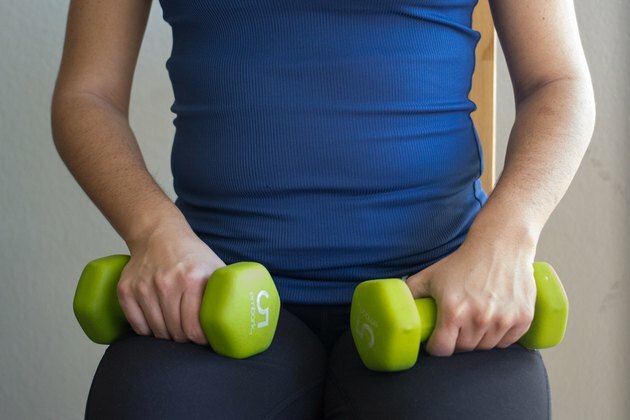 Hold a 3- to 5-pound weight in each hand. While holding the weights, place your hands behind your head with elbows bent and pointing toward the ceiling. 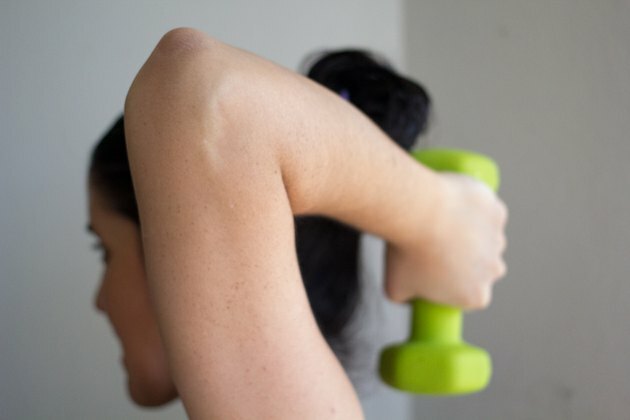 Slowly lift the weights toward the ceiling while keeping your elbows stationary. Lower the weights behind your head so your elbows are pointing to the ceiling, and repeat this movement. Do two sets of 10 to 12 repetitions. Rest for one minute between sets. Stand with your legs hip-width apart, knees slightly bent and tailbone tucked under. 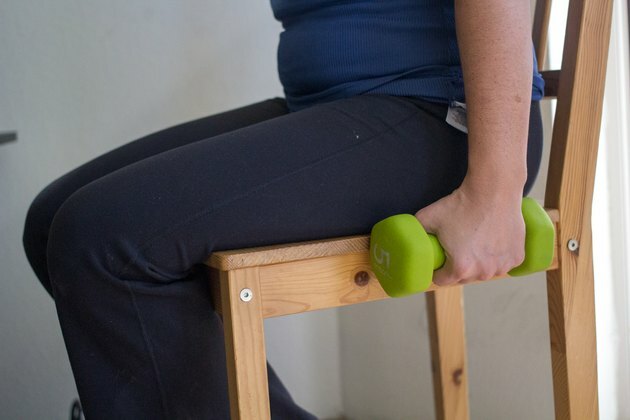 Hold a 3- to 5-pound weight in each hand and let each arm hang at your side with palms facing your thighs. Slowly lift both arms out to the side, up to shoulder height only. Keep elbows slightly bent and palms facing the floor. Lower your arms back to your sides with palms facing your thighs and elbows still slightly bent. Repeat this movement in a slow, controlled manner. Do two sets of 10 to 12 repetitions. Rest for one minute between sets. Check with your midwife or doctor before beginning any exercise program. Keep a water bottle with you during exercise and drink before, during and after exercising to stay hydrated. Exercise three to seven times per week and do a variety of exercises including cardiovascular along with specific pregnancy exercises. When lifting weights, keep your movement slow and controlled, never swinging the weights. Do not lie flat on your back, which can cause dizziness and shortness of breath. 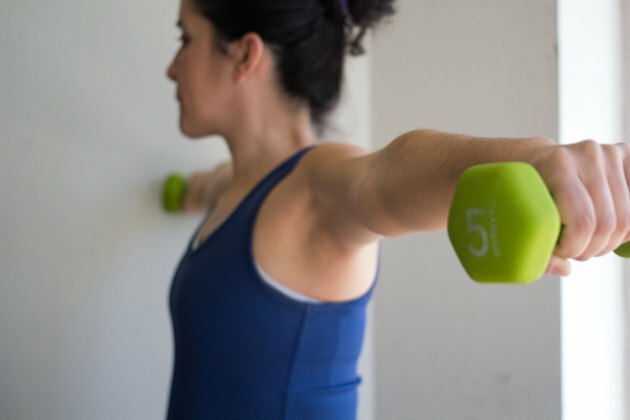 Stop exercising immediately if you experience sharp, sudden pain, headache, nausea, dizziness, blurred vision, vaginal bleeding or strong uterine contractions. Exercising Through Your Pregnancy; Clapp, M.D. &amp; Cram, M.S.